Automatic water shutoff systems are the difference between knowing there’s a problem and knowing the problem’s being taken care of. But finding that kind of peace of mind isn’t always straightforward. 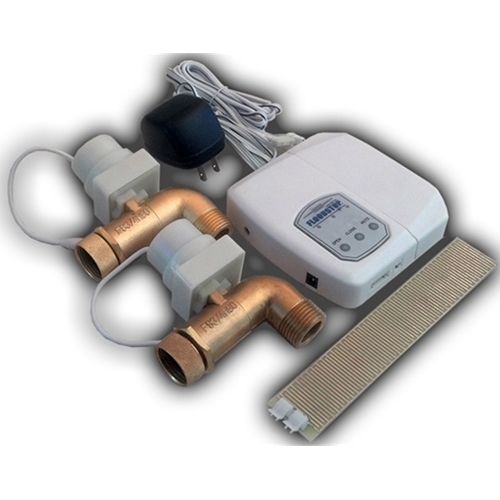 Every year there are more and more automatic water shutoff systems coming onto the market. What do you need to look for? We’re going to break down the competing products by price, functionality, smart home compatibility, and features. So here’s a complete breakdown of some of the top automatic water shutoff systems available today. The first example is one of the older products on the market: Watercop. The system actually has a decent list of features, but falls prey to high prices and concerns about ongoing support. What are the features here? Like the other systems on this list, Watercop has sensors to detect leaks and a valve to shut off the main water supply when leaks are detected. The big difference is a lack of smart home integration. That means you can’t get notifications of leaks or control the main valve shutoff mechanism from your smartphone. Still, there are some cool features here, like the ability to control the main valve with a wall switch and have it automatically detect freezing temperatures to shut off the water and protect your pipes. However, those features only come with add-ons, which cost around $40 and $100 respectively. Everything here is sold separately, meaning slightly higher costs, but also greater flexibility. The control valve costs over $400, while each sensor is an extra $70. Those prices aren’t bad, but considering their website hasn’t seen any updates since November 2015, we have concerns about ongoing support for the product. This is an interesting take on the idea of an automatic shutoff system. Floodstop is designed specifically with washing machines in mind, with another version designed for water heaters. When it detects a leak, it turns off the water to the washing machine and the appliance itself. This is nice, considering that it won’t affect the rest of your home’s water supply if this occurs. However, it’s obviously a bit limiting, considering leaks can occur in many other parts of the home. If you’re primarily concerned about your washing machine or water heater, this is an affordable option. But if you’re in the market for a more complete system with features like smart home integration (Floodstop only sounds an alarm and doesn’t integrate with smartphones or smarthome tech), you’ll want to find a more complete system. One of the newest automatic water shutoff and leak prevention systems here, LeakSmart focuses on the benefits of smart home integration. To start, it has the basic items you’ll find with any of these systems: There are leak detectors and a main hub to shut off the main water valve in case of a leak. But beyond that, LeakSmart will send you a notification if a leak is detected. So in addition to knowing the main valve will be shut off, you or someone you trust can take a look. This also means you can shut off your main valve remotely. True, it doesn’t have an automatic system to detect freezes like with Watercop. But that smart home integration means you could use smarthome gadgets like Google Home to trigger a shut-off if freezing temperatures occur. The price is just over $100 more than Watercop for the basic system with one sensor, but for that price, you get the smart home integration. After that, additional sensors are only around $40, compared to $70 for Watercop. Overall, this makes Leaksmart a great buy for its features and competitive pricing. Similar to Watercop, Flo Logic does all the basics. It’s got a sensor, an automatic shutoff valve, all the things you’d expect. The issue here is with features and price. As far as features go, you really don’t get anything beyond those basics. There are no freeze detectors, it only comes with one sensor, and it doesn’t integrate into a smart home. That means you can’t use it with your smartphone either. That would all be fine if Flo Logic were affordable, but it’s by far the most expensive system here. The entire basic setup costs almost $1,600. For that price, quite frankly, it should do a lot more. What Features Are You Looking For in an Automatic Water Shutoff System? We’ve tried to focus on what we think is important when comparing these platforms, but what are you looking for? We’d love to know so comment or write us directly.